In the Monte Carlo Simulation software program you will find a compound interest table. This table allows you to quickly see how a specific annual percentage will grow over time. You can look at it two different ways. 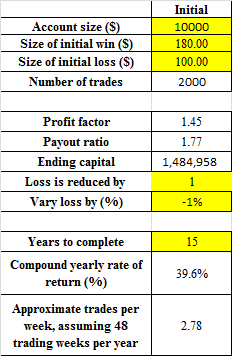 In the first table, the value that is returned is a multiplier. It tells you how much your account would have grown by over a specific time period given a specific annual return. As an example, after 10 years at 8% your account will be 2.1589 times as large as it is today. In the second table, the value in the table has already been multiplied by the account size. So in the above example, with a starting account (SA) size of $10,000, the result would be 21,589. This is a useful table as it provides you with a very quick estimation of where you need to be depending on your time horizon. Compound interest let's you know how to go from where you are to where you want to be. For instance, if you are 40 years old and have $20,000 saved up you can quickly identify what type of yearly return you will require to achieve the amount of money that you believe you need in 20 years. The table above is expanded in the Monte Carlo Simulator for Traders Excel program It compounds 30 years worth of interest at interest rates from 1 to 30 percent. Considering the best mutual fund managers obtain less than 25% annual return, this table should provide most traders with the information they require. You can get a copy of this program for $20. This program also comes with a Support Manual to help you get the information you require when using it. 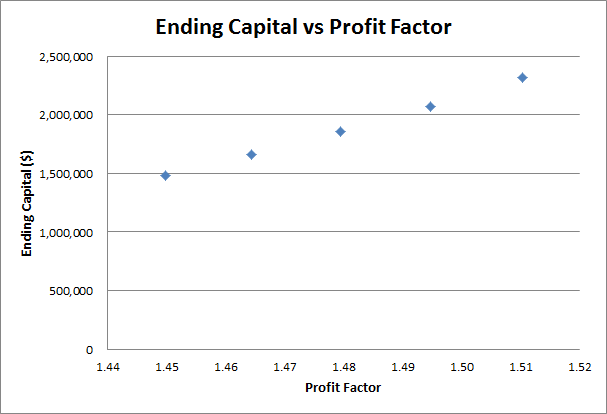 The last worksheet in this Monet Carlo Simulator for Traders looks at a profit factor and payoff ratio. One of the things I found was that the final equity I was getting was not always in line with what I had expected. That turned out to be a result of the amount risked on each trade. For instance, risking 2% of your account vs 1% of your account on a trade, over time makes a huge difference in your final equity. This of course can be on the positive or negative side. In the above table, you can enter any of the numbers highlighted in yellow. This then produces a graph which is shown below. This graph plots a line of ending equity vs the profit factor for the trading system under investigation. It is just another way to explore your options. In the above discussion, I have attempted to educate you on how a Monte Carlo simulator works. 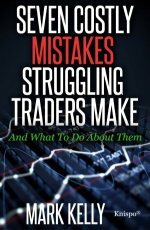 Interested in continuing this education and understanding how you need to accept losses before you can make profits? 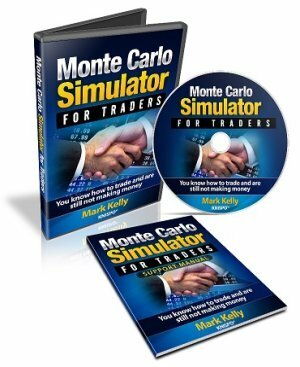 You can get a copy of this Monte Carlo Simulator for Traders program for $20 and start to put your own numbers in and start to chart your course. All of the work has been done for you in the The Monte Carlo Simulator for Traders program which costs $20. The graphs which have been described on this and other pages should be able to help you move tot he next level. You can get a copy of it by following the link below. The link will take you to PayPal and once you have logged into PayPal you can apply any discount coupon you have. Once you have paid for the program, you will be redirected to a webpage where you can download the Monte Carlo Simulator for Traders program which is Excel based. I also have a couple of bonuses on this page which you may find interesting.